London's history may have been dominated by the fat man with a penchant for wedding cake this year, but he's not the only show in town. Kensington Central Library are putting on a series of talks with some big names between 2nd - 10th November that really are worth checking out. Everything kicks off on Tuesday with Simon Sebag-Montefiore discussing his favourite historical figures (expect some Russians to feature) as well as his rather successful career. Other talks cover Charles I and the origins of the English Civil War; women in history and whether they were the real power behind the throne, with a panel including Alison Weir; the strategy and tactics of Waterloo, Rorke's Drift and Inkerman; and two evenings on war (so that's what it's good for) - one with former Telegraph war correspondent Patrick Bishop in conversation with Nigel Jones, and a history of war reporting chaired by Colin Freeman, chief foreign correspondent for the Sunday Telegraph. We've got 10 pairs of tickets for this last event to give away - keep an eye on the @londonist Twitter account over the next few days and we'll let you know how you can get your mitts on them. 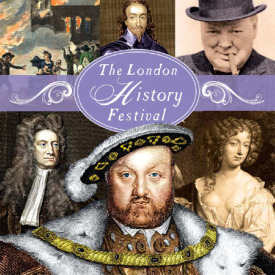 The London History Festival runs 2nd - 10th November at Kensington Central Library, Phillimore Walk W8. All events start 7pm, tickets £5 / £3 or £20 / £15 for all six events. See the website for more information.